A viewer listens into a single cell in the human-scaled bumblebee nest emanating a score of foraging bees. There are thousands of species out there having a very different experience of our shared planet. I really want you to become a bee. Stetson University is a-buzz in anticipation of a new exhibit arriving in January that will submerge visitors in the life of bees. A Better Nectar, by Jessica Rath, is an immersive experience using sculpture, light, sound, photographs and watercolor to explore the bumblebee's journey. Co-hosted by the Homer and Dolly Hand Art Center and the Gillespie Museum, and co-sponsored by the University’s Artists and Lecture Series. the exhibit will be on display in both museums from Jan. 26 through March 3, including several events. A multisensory installation based on Rath’s extensive research into communication between flowering plants and their pollinators, A Better Nectar, reveals to guests what life would be like as a bee. “There are thousands of species out there having a very different experience of our shared planet. I really want you to become a bee,” explains Rath. “The exhibition is meant to put us on a more level playing field with another being." Rath creates an immersive experience using human-size sculptural forms, light and sound to explore how bumblebees learn and remember multisensory floral symbols to find a better nectar. The exhibit will be divided between Stetson University’s Hand Art Center and the Gillespie Museum, the first time the university has simultaneously displayed an exhibit in both museums. “a better nectar" was built on scientific research and interpretation through art. 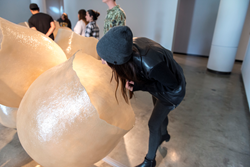 “It is a wonderful confluence for the exhibition to be shown in both the art and science museums on campus, to connect students to the creativity found in both disciplines. The pollinator garden just outside the door of Gillespie extends the kind of deep observation of other species that I was seeking while making this work," said Rath. Science Café, “Bee Sensoria: Artists’ Perspective,” Wednesday, Jan. 24, 7 p.m.
Rath and composer and sound designer Robert Hoehn will explore the role scientific observation and data played in creating the “artist perspective” on the sensory experience of bees. They researched bee foraging patterns and bee-to-flower communication at the Leonard Bee Lab (University of Nevada, Reno) which translated into a “buzz pollinated,” seven-foot flower anther and a human-scaled bumblebee nest that emanates a six-part score and changes with a live NOAA weather feed. Lecture with Jessica Rath and Robert Hoehn, Thursday, Jan. 25, 7-8 p.m. Opening Reception, Friday, Jan. 26, 6 p.m.
On exhibit at the Gillespie is the seven-foot “Staminal Evolution,” a sculpture based on flowers that require “buzz pollination,” a process in which bees vibrate a certain frequency to open the flower and thus release its pollen. A research station at the Gillespie includes a gallery of digital images of Florida native pollinators, taken by Peter May, Ph.D., professor of Biology at Stetson; displays of native pollinating insects, assembled by Cynthia Bennington, Ph.D., professor of Biology at Stetson; and a seed library, from which visitors may “borrow” the seeds of native plants to sow at home. Composer and sound designer Robert Hoehn received his BFA in Electro-Acoustic Composition from California Institute of the Arts in 1994 with additional studies at the Center for Computer Research in Music and Acoustics at Stanford University and the Hartt School of Music at University of Hartford. Trained as a musician, composer and keyboardist, Hoehn creates music and sound for picture and builds interactive electronic sound systems for galleries, and experimental mechanical acoustical sound sculptures, most often exhibited in art and music festivals. In 2014, Hoehn created Wind Sound Sanctuary with funding from Burning Man Arts, a 50-foot playable pipe organ, windmill-driven with custom Aeolian harps. The Hand Art Center is on the Stetson University campus at 139 East Michigan Avenue, DeLand, Florida, 32723. It is open to the public free of charge. In addition to the Vera Bluemner Kouba Collection, it has a broad collection of artwork by Stetson University students, art faculty and alumni. The 5,000-square-foot building includes multiple galleries: The Oscar Bluemner Gallery exhibits rotating selections of the artist’s work and the Gary Libby Gallery hosts exhibits from the university’s permanent art collection or special shows. Except for holidays and university vacations, Hand Art Center is open Monday through Wednesday and Friday, 11 a.m.-4 p.m.; Thursday, 11 a.m.-6 p.m.; and Saturday, noon-4 p.m. All exhibits are open to the public free of charge. The Gillespie Museum is located at 234 E. Michigan Ave., DeLand, Fla., 32723. The Museum’s Science Cafés promote scientific literacy by encouraging relaxed, open discussions among scientists and nonscientists of all ages. For more information about Stetson’s Science Café series, contact Cole at kcole@stetson.edu or visit the museum website at http://www.stetson.edu/gillespie.